Kitty Hawk and the Tragedy of the RMS Titanic by Iain Reading is the fourth book in the Kitty Hawk Flying Detective Agency series. Having read the previous books in this series, I have enjoyed following Kitty on her many adventures and solving the mysteries she encounters. 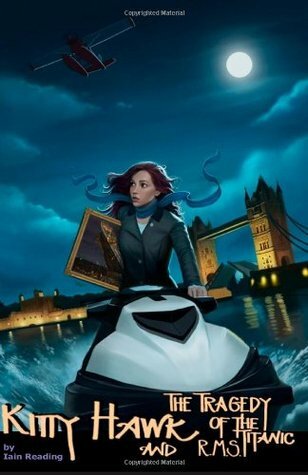 This book has her travelling to Ireland and solving a mystery that involves the sunken Titanic. Full of intrigue, lovely settings, adventurous and a good mystery, I enjoyed reading the book. Iain Reading's writing is his usual captivating self and if he sometimes over describes some scenes then it didn't concern me much because he had me engrossed in the story. The only letdown I felt was with Kitty. I didn't connect with her as much as I would have liked to do and did in the previous books. I liked her but still not as much as I usually do. The book is fast paced and will be liked by lovers of teenage and YA mysteries with lovely settings and a realistic heroine. Despite being part of a series, it can be read as a standalone.